You may remember back in December, when I was able to share news of inov-8 working on a series of shoes, incorporating graphene into the outsole. Details were limited and despite several attempts, the team at inov-8 were tight lipped, not willing to say anything about their new products. Well, it’s time to reveal all. Normally when I talk about new products, it can be a series of minor updates or a new product altogether, utilising current tech. The G-SERIES are a little different. The G-SERIES are the World’s first sports shoes to utilise graphene, the strongest material on the planet. 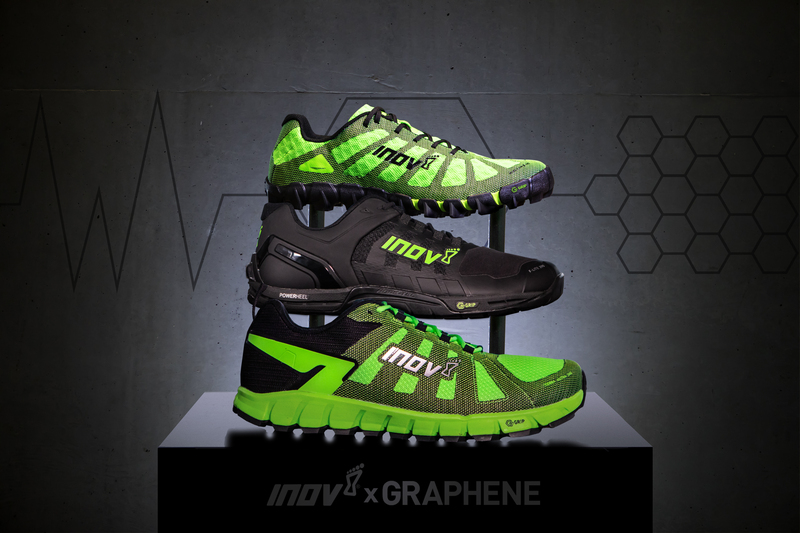 inov-8 have collaborated with the graphene experts from Manchester University, who rediscovered, isolated, and characterised the semi material in 2004 by Andre Geim and Konstantin Novoselov. Graphene has been infused into the rubber outsoles, which have been shown to outlast 1000 miles of running and scientifically proven to be 50% harder wearing. Graphene is 200% stronger than steel, super lightweight and the thinnest material on earth. The scientists who first isolated graphene from graphite were awarded the Nobel Prize in 2010. Building on their revolutionary work, a team of over 300 staff at The University of Manchester has pioneered projects into graphene-enhanced prototypes, from sports cars and medical devices to aeroplanes. Now the University can add graphene-enhanced sports footwear to its list of world-firsts. Dr Aravind Vijayaraghavan, Reader in Nanomaterials at The University of Manchester, said: “Using graphene we have developed G-SERIES outsole rubbers that are scientifically tested to be 50% stronger, 50% more elastic and 50% harder wearing. “We are delighted to put graphene on the shelves of 250 retail stores all over the world and make it accessible to everyone. Graphene is a versatile material with limitless potential and in coming years we expect to deliver graphene technologies in composites, coatings and sensors, many of which will further revolutionise sports prod. Graphene is a sheet of carbon just one atom thick. It’s the world’s first two-dimensional material and unlike any other in the world. Graphene is the strongest material on the planet. It’s 200 times stronger than steel. It’s also the thinnest material in the world. Graphene is closely related to a more well-known material – graphite, which is made of millions of graphene layers stacked on top of one another. Graphene was isolated from graphite for the first time at The University of Manchester in 2004. The two scientists who did this, Andre Geim and Kostya Novoselov, were awarded the Nobel Prize in Physics in 2010. So there is a price rise, however, with promise of many more miles from every pair of shoes, through the use of graphene and kevlar, could this therefore make them cheaper in the long run? Also, are any of you thinking the same as me, what about the RoadTalon or RoadClaw….? Graphene is being utilised in tyres and all manner of products, some more successfully then others and this World first could be a game changer for both inov-8 and the wider industry. Now, I’ve been speaking to the bods at inov-8 and though they can’t promise at this time I’ll be getting a pair of G-SERIES shoes to test, I’ll be doing my best to get a set on my feet and feedback how they stack up to their claims. Clearly, getting a standard inov-8 shoe and G-Series, strapping them to a belt sander and using a stop watch, isn’t going to give the most accurate of tests. Though, I know what you are thinking, it would be pretty different and cool to witness. A brand known for their grip, how will the blend of compounds effect the grip in terms of outright grip in wet conditions, rock and what this will do for the ride. So many questions and only one way to find out…. Keep an eye out for more news and as ever, subscribe for regular content.